this is the best combination which can be done in one day from Delhi to Jaipur and back to Delhi. For your convenience we make sure that you get best guidance regarding how to travel from Delhi to Jaipur, call us at 7042661212. Further check details below and book this tour tickets timely online, in order to save yourself from last minute hassles. Best Combination of Delhi – Jaipur – Delhi Tour. Most Importantly, if an Indian Citizen will accompany Foreigners on Delhi to Jaipur Bus Tour, therefore all Foreigners will be charged at Indian price. Also, bus will stop for lunch on the way. But we suggest passengers to carry Drinking Water and Eatables with them, because sometime due to traffic bus may take time to reach the eating joint. 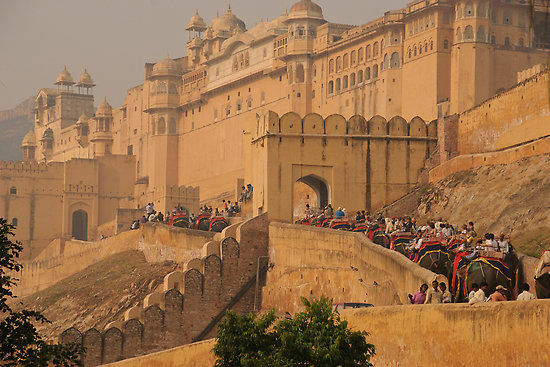 Delhi to Jaipur Same day tour from Delhi to Jaipur will start at 6:30 am from Delhi and ends at 11:30 pm (approximately) at Delhi and will be as per the itinerary. Due to traffic on Delhi – Jaipur – Delhi highway and some time passengers delay the tour at monuments, so we expect delays while returning back to Delhi. Kindly co-operate in Delhi to Jaipur Bus Tour.